Come join us for the seventh annual All Bethel Community Day on October 3, 2015. ABC Day sponsored by the Boeing Company, Bethel School District, Bethel Community Services, Umpqua Bank, Bethel Area Council of PTA’s and Central Pierce Fire & Rescue will give Bethel citizens the opportunity to celebrate our community. ABC Day was established to give Bethel students and community members a venue to showcase their talents, to honor our local military service members and to connect families with school, business and community resources. In addition to great food and entertainment, event goers will enjoy wagon rides from Country Wagon Ranch, Point Defiance Zoo animals, Umpqua Bank’s ice cream treats, Kawshun the Clown, the Seattle Seahawks’ Blitz, Fun Ballz and Marvel Comic’s Iron Man and Spiderman. 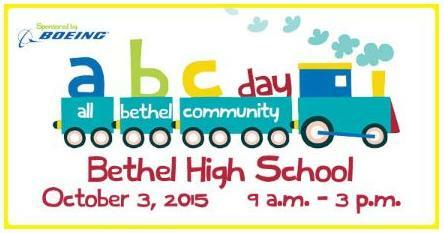 All Bethel Community Day will be held Saturday, October 3, from 9:00 am to 3:00 pm. at Bethel High School, located at 22115 – 38th Ave E., Spanaway. Admission is free. The Bethel area is comprised of the several communities in South Pierce County, including: Graham, Frederickson, Kapowsin, Roy and Spanaway. For more information, please contact Jay Brower, Director of Community Connections.